Can I Dilute Liquid Bleach for My Aerobic System? Operating and maintaining an aerobic system requires you as the homeowner to add chlorine to your septic system. If you choose to use liquid chlorine, you can dilute it without rendering it ineffective. Diluting your bleach is not required, but if you’d like to save a few extra dollars we recommend diluting concentrated liquid bleach with 2 parts water and 1 part bleach. Note that I said concentrated bleach. 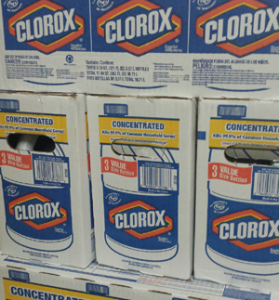 If the bleach you purchase is labeled “regular strength” instead of “concentrated,” you should not dilute it. Do not use pool chlorine tablets or liquid in your aerobic system — it’s ineffective at treating wastewater, and over time can build up enough nitrogen chloride to cause an explosion. If you have questions about how to keep your septic system functioning properly, we have answers. Sign up for a free phone consultation to talk with a member of our expert team. Do I still need to pour something down the toilet? I think it’s called REX? And how often do I put chlorine in the tank outside? You don’t need to add any additives down the toilet, and sometimes that can do more harm than good. How often you need to add chlorine will depend on your usage – you will just need to monitor it. Check it every 2-4 weeks on average. I have an aerobic system and have had no problems until lately when we had a lot of rain. We have many gopher tunnels in our neighborhood. After heavy rains the septic tank fills up and the sprinklers go off. That is when I have noticed that a sink hole was forming towards the bottom of the yard. I then found that a gopher tunnel was carrying the water to the sink hole. Could this be that I have a leak in the sprinkler lines? I have three sprinklers and that would be difficult to find out where the leak is. This only happens when we get a lot of rain and the sprinklers go off more often. Also, the water from the sprinklers does not hit the area where the tunnel is. Gophers are not a problem in our area. This is something I’ve never heard of before, so I’m afraid I don’t have any advice except to contact a local aerobic system service company to visit your property for evaluation. Best of luck! We currently have a 1 year old aerobic bleach septic system and its been working great. This last week we started smelling higher and higher levels of bleach smells coming from all of our drains. When using any sink or shower it smells as if you just poured a cup of bleach down the drain. Today my wife said her eyes started burning after taking a shower due to the smell. Her shower is closest to the aerobic septic system. If I take a shower on the other side of the house it still smells, but its not too bad. I’ve never heard of this issue before, and we service over 1000 aerobic systems. 1 gallon of bleach is within normal range. The bleach you put into your system usually goes into the last tank/compartment of an aerobic system, so the gases would have to travel pretty far back towards the house. The gases from the aerobic system do vent back up through the house plumbing, but should except out of the roof vents without odor in your house. Perhaps check your roof vents to be sure they are not clogged to allow the proper path for gases to escape, in the unlikely event that the bleach smell is actually coming from your system. Do you put bleach down your A/C drain lines? The can cause the smell in the drains. Are any neighbors experiencing the smell? If so, perhaps contact your water company. Please post an update of what you discover is the issue! I have a arobic system can I use Clorox bleach in my white laundry?